Every year there is a voting mock draft in the draft forum. I like to let only team fans vote for the pick. The 2018 Forum by forum mock draft is here. The Cincinnati Bengals are on the clock with pick 21. The first guy to 5 picks is the selection. If no one gets to 5 after 24 hours the leader wins. In case of a tie the earliest to the lead total wins. If you discuss multiple gys in your post, please make a clear indication in your post who your actual choice is. Wynn, Wynn, Wynn, and Wynn. That's five votes for him. I’d go with Mo Hurst. I'll let this run a little longer since I'm a Bengals fan. 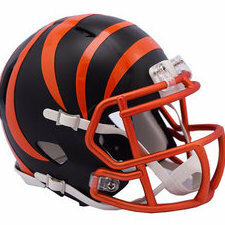 When did the Davenport to the Bengals movement start? So DE sort of makes sense, if you're planning ahead a little. MJ is basically done. Dunlap is on the last year of his deal, and i don't think he'll get another one. That leaves the team with Jordan Willis and Carl Lawson. If they had been smart, they would have cut MJ and used the saved money to keep Chris Smith. Now they're looking a little thin, and potentially in a situation where they have to overpay an aging Dunlap to keep some sort of unit together. That being said, i'd rather they take a center. So i'll go with @THE DUKE and say Ragnow. That being said, i'd rather they take a center. So i'll go with Duke and say Ragnow. Eh. Dunlap is 29, and the talk from Hobson's annual 'why we have no money for free agents' is that money will be spent extending Dunlap and Geno. Considering we don't have a lot of high priced players, I think we can afford to keep both. Extend Dunlap for 3 years, which gives us time to dump his contract and extend Lawson when he becomes a FA. I judged him to be BPA.